The plant is a bushy shrub 1-6 m in height with pale grey bark; the spreading branches swollen at the nodes and white-hairy when young. The evergreen, opposite, short-petioled, bluntly elliptical leaves are thick, leathery, 3-6 cm long, smooth and glossy on the upper surface, finely veiny and silvery-hairy beneath. Conspicuous, bisexual flowers, 4 cm wide, borne singly or in clusters, have 4 fleshy, oval, concave petals, white outside, purplish-red inside and a cluster of numerous, erect, purple stamens with round, golden-yellow anthers. There are usually 20 to 40, occasionally as many as 100, very small, oblong seeds hardly noticeable when the fruit is eaten. The fruit is green, chicken-egg-sized, and ellipsoid-shaped. It has a sweet, aromatic flavour. The flesh is juicy and is divided into a clear jelly-like seed pulp and a firmer, slightly gritty opaque flesh nearer the skin. The fruit is usually eaten by cutting it in half, then scooping out the pulp with a spoon. The fruits have a juicy sweet seed pulp, and slightly gritty flesh nearer the skin. The flavour is aromatic and sweet. The feijoa needs a subtropical climate with low humidity. The optimum annual rainfall is 30 to 40 in (762-1,016 mm). The plant thrives where the weather is cool part of the year and it can withstand temperatures as low as 10�C. The flavour of the fruit is much better in cool than in warm regions. While the shrub is often said to be adapted to a wide range of soil types it actually prefers rich organic soil and is not very thrifty on light or sandy terrain. It is drought-resistant but needs adequate water for fruit production. The site must be well-drained. 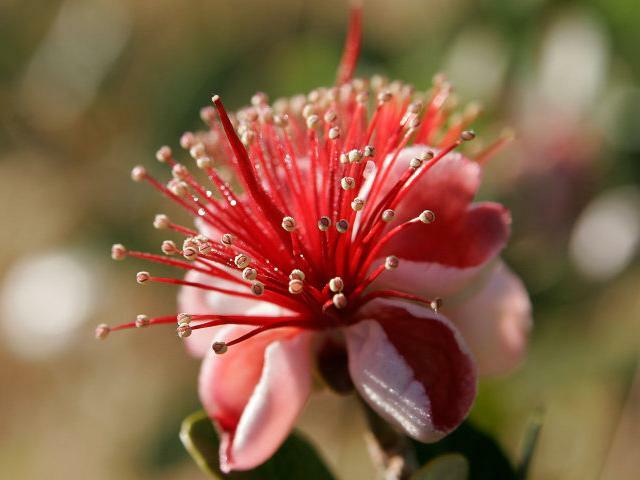 The feijoa can tolerate partial shade and slight exposure to salt spray. 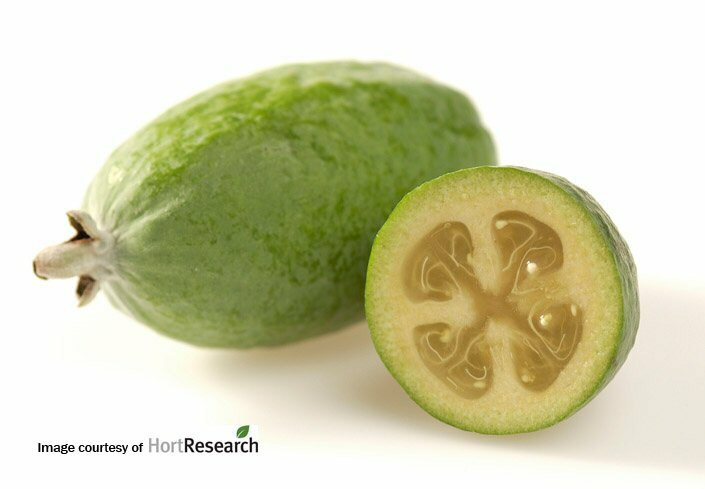 The feijoa is generally grown from seed and reproduces fairly, but not absolutely, true to type. Seeds are separated by squeezing the seedy pulp into a container, covering with water, and letting the liquid stand for 4 days to ferment. Seeds are then strained out and dried before sowing. The seeds will retain viability for a year or more if kept dry. Germination takes place in 3 weeks.